Text Reflow Mode: The text reflow feature allows for more effective reading of ebooks, magazines, and articles while on the go. Text reflow shows a text-only view of a PDF document and automatically reflows the content to fit the screen width as users zoom in and out. Font size can be increased or decreased according to reading preferences. This view provides an exceptional reading experience on smaller Android phones and tablets by eliminating the need for horizontal scrolling. form field validation to prevent users from entering invalid data and ensuring that all required data is filled in. “File” menu to open, save, or send/share files. “View” menu to change to text reflow mode, go to the outline / bookmarks / comments pane, go to page, zoom, and lock the navigation overlay. “Document” menu to add new pages, flatten annotations and fields, or go to the fast form fill view. In addition, all colors and icons were redesigned for a streamlined, sleek new look consistent with the overall Android Holo style. Add Images: Version 3.0 adds the ability to easily add images / pictures as annotations onto PDF documents or add them to interactive PDF form image fields. Images can come from the device, cloud services or directly from the camera, simplifying the daily routine of professionals such as home inspectors or insurance agents when creating inspection reports. To celebrate qPDF Notes’ new release, the app is offered at 50% discount through December. Users who are currently evaluating qPDF Notes Demo are encouraged to take advantage of this opportunity to upgrade to qPDF Notes Full Version. Qoppa Software makes the PDF technology found in its apps available in an Android PDF SDK for Android developers to integrate into their own apps. Qoppa’s Android products are available for all Android phones and tablets 2.1 or higher including: Nexus 7, Samsung Galaxy S2 and S3, Asus Transformer Prime, Acer Iconia, Samsung Galaxy Tab, Samsung Galaxy Note and Galaxy Note 10.1, Motorola XOOM, Kindle Fire, Nook Color, Blackberry Playbook and devices with custom ROMs. Qoppa Software specializes in the development of high-end libraries and applications to work with PDF documents. Qoppa Software offers a suite of highly portable products that cover every aspect of PDF processes and integrate seamlessly into document work flows, including end-user, server and PDF library products. Qoppa’s products are carefully designed and developed on Qoppa’s own robust PDF technology to provide the highest level of performance and reliability. A whole new look for qPDF Notes 3.0 (see before and after pictures). 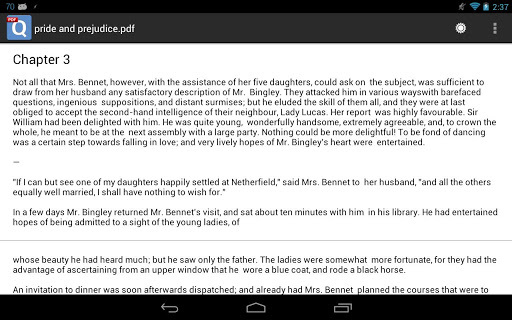 Qoppa’s PDF reader app for Android hits 100,000 downloads! Qoppa Software is happy to announce that qPDF Viewer – its PDF reader app for Android – has reached the milestone of 100,000 downloads on Google Play this week! “We’re glad that so many Android users have elected qPDF Viewer as their favorite app to read PDF documents on Android phones and tablets. But this is only the beginning! We’re in the process of finalizing a major release of our app with many exciting new features that we expect will please our users even more!” says Gerald Holmann, Qoppa Software’s president. Marking preferred passages with personal bookmarks inside a PDF document. Easily navigating through PDFs using the documents’ table of contents, hyperlinks or added comments / annotations. Efficiently searching text through PDF documents using the advanced search feature. * Phone and tablets supported include: Nexus 7, Samsung Galaxy S2 and Galaxy S3, Asus Transformer Prime, Acer Iconia, Samsung Galaxy Tab, Samsung Galaxy Note, Motorola XOOM, Lenovo Thinkpad, Kindle Fire, Nook Color, Sony Xperia, devices with custom ROMs. This entry was posted in Android PDF and tagged alternative to adobe, Android, Free, PDF app, PDF reader on September 24, 2012 by qoppacom.